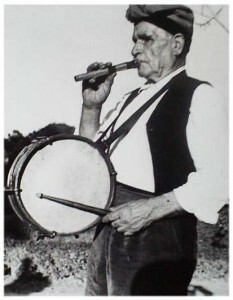 “Flabiol” is a kind of recorder typical of Catalonia and other regions in Spain. It’s a woodwind instrument and we play it by blowing through a fipple. It is 20 or 25 cm long and it has 5 holes on the top and 3 holes underneath. It sounds really high. It’s played just with your left hand and at the same time with the other hand you play the “tamborí”, which is a mamranophone instrument (percussion), played by stricking the membrane with a little drumstick. 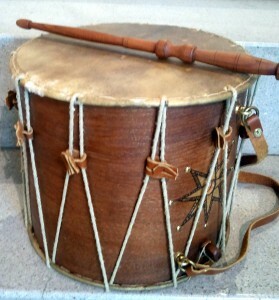 This instrument is really important as it follows the rhythm of the music. The person who playes the tamborí and flabiol is called “flabiolaire”and he playes in a “Cobla”, which is the traditional Catalan instrumental group which plays the music when people dance “Sardana”, the traditional Catalan dance. 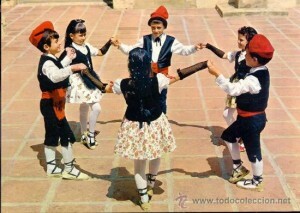 When people dance the Sardana, they make a circle, t hey hold their hands and they dance together.